This is an open source toy which generates plausible IDM track names using a poorly-implemented Markov chain. Refresh the page to generate another. 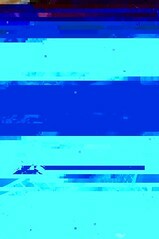 The cover photo is qf#kbZ8SXfV4:NI?P by GlitchBot. Made by wjt; powered by Snap and Flickr; inspired by, and design stolen from, Our Band Is Called by Alexandre Testu and Kevin Bongart; fueled by a deep admiration for Autechre, Three Trapped Tigers, and all the other bands whose track names formed the source material.